One of the alarming thoughts that wakes me from my deepest sleeps in the middle of the night has come to fruition. To some, this may sound stupid and I accept that but I am sharing this anyway. The past few days I’ve been grappling with the fact that my smalls are considerably less small than they were when I started blogging and as of today, I have but ONE child left whose age is summed up by a single digit. The rest have all joined the double-digit club and I’m struggling with this reality. My youngest son turned 10 this afternoon and his mother is, as usual, a virtual mess of emotions. I am beyond happy that they are all growing, healthy, smart and strong. At the same time, I feel incredibly sad that they are no longer small and scrumptious. They are, obviously, still young, they are still children and will always be my babies, but even I must admit that there is not an actual baby among them anymore and that makes my heart hurt in ways that I feel stupid for admitting. So today, I try really hard to keep my head in the birthday game. Baking and (poorly) decorating cakes, preparing the requested birthday dinner, hunting down the perfect birthday gift, attaching the specially chosen helium balloon to his chair and telling myself that tears are NOT appropriate today. Today is for happiness. Today marks one of the very best and happiest days of my life, the day I finally came face-to-face with his perfect little self. So why then, does it feel like a very long chapter of my life is closing and moving me, not so gently, onto another stage of life? A stage of life for which I feel ill-prepared and completely not interested in entering. I have to Scarlet O’Hara this issue and think about it tomorrow. Today, the only thing that I know for sure is that today is NOT my day. This is not my day to show sadness, sorrow or pain. This day is decidedly NOT about me. Today is my Paxton’s day to smile, giggle, eat hot dogs and cake (with luck, not at the same time) and open presents and burst with excitement when he sees what hides beneath the wrapping paper. Today is his day to feel the pride of being 10, to feel all the very big feelings of being bigger, older, faster, and smarter than he felt yesterday (that extra digit can do that to a kid), but also, because today he is all of those things. Share the post "Subtly, slowly, my life is changing. Oh, and Pax turns 10"
I never thought of that. But it makes perfect sense why he would believe that ‘excuse me’ is a natural air freshener. A little bit weird, a little bit genius (although please note, it did not actually work. It still stunk). Pax – When you grow up, you have to take care of and help the people who helped you when you were little. That’s just the way it is. Right, Mummy? Pax – Miranda, when you grow up and have a baby, do you hope that it’s a boy? Miranda – Do girls pee when they’re babies? Pax – I think so. But you have to be happy with whatever baby you get. If it’s a boy or a girl, you just have to be happy with it. Right, Mummy? Paxton: Is that chicken from a farm? Paxton: I don’t want to eat chicken that lives on a farm! I just want to eat regular chicken! Paxton: (louder whisper and a little disgusted at her faux pas) Ugh! No, we’re not Mur-an-da. Me: Um, I don’t think we’re having another baby, honey. Why would you want another baby? We have lots of people already, don’t we? Deacon: Yeah, but I want a baby. Because then I would have another little brother or sister. And I want another sibling. And I like babies better. That’s why I always want to sit with Miranda. I don’t really get along so good with Paxton. Mason: I get along with Paxton but not really with Deacon. And ya, babies are so cute and they don’t hurt you, they’re just so soft and cute and stuff. Miranda: I get along with everyone! And I LOVE BABIES! If we had a baby she would sleep in my room and I would take care of her with Mummy. Right, Mummy? Me: Guys, I don’t think we’ll be having another baby. But you’re all right, babies are amazing. And all of you guys were amazing babies and now you’re amazing bigger kids, right? P.S. If you’ have not ‘Liked’ The Keswick Blog on Facebook or ‘Followed’ along on Twitter, Instagram or checked out The Keswick Blog on Pinterest, then you’re missing out on micro-blogging that happens when time or circumstances do not allow for a full-blown blog entry 🙂 Come on over and jump on my crazy train! Share the post "If you say ‘Excuse me’ it won’t stink and other sound bytes from my minion army"
Keswick Public School had a family dance tonight. Since a couple of our smalls attend there, I dressed up my crew and off we went. And we had FUN! If you’ve never danced with a couple of four-year-olds, I highly recommend it. 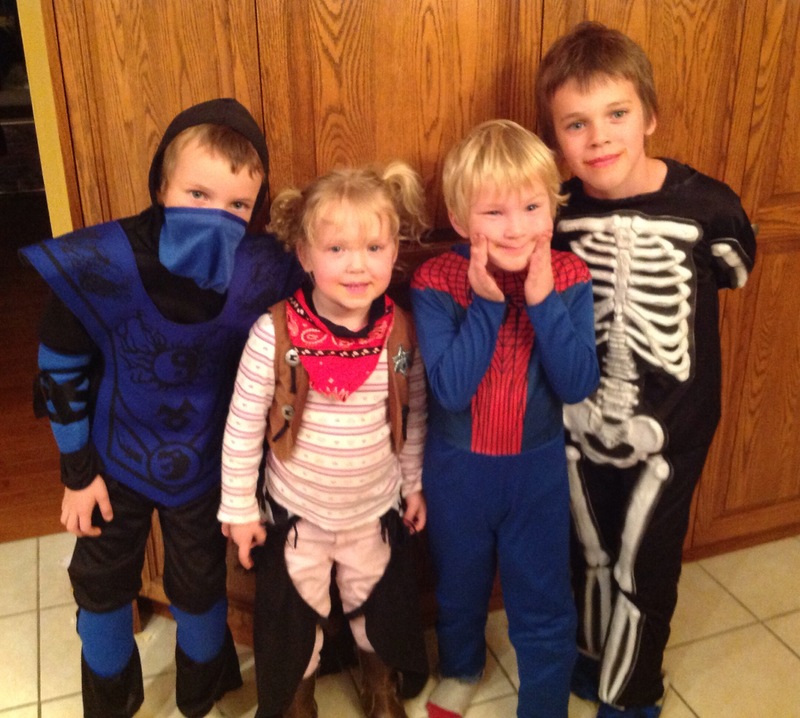 I am not sure if I will have a Ninja Lord, Cowgirl, Spider-Man, and Skeleton tomorrow night for trick or treating (minds and costumes change rapidly around here) but I had them tonight. And I’m mindful that these moments are limited time offers, so I am holding them close to my heart. Also tonight, I am quietly marking the 24th anniversary of my father’s passing. 42 was too damned young to go, I wish I had more time with him, and I really wish that he could see my smalls on this, his most favourite holiday of the year. It took me a long time to be able to enjoy Halloween after he passed, but every year I derive more happiness from the day and look forward to sharing stories and memories of him with my kids. Share the post "Halloween Dress Rehearsal and a death-a-versary"